Home | Improving Performance? Really? Decreasing turnover and increasing productivity can be a sticky problem. Solutions usually come in one strength: weak. That is, incentive programs, public awards, and social get-togethers generally fail to make a long-term financial impression. I won’t claim that employee appreciation programs aren’t a nice touch; after all, everyone wants to feel appreciated. But such recognition does not solve the real problem. Jobs are considerably more complicated than they appear. The recruiting and hiring process is easy to understand. The hard part begins after hiring. That’s when employees begin to endure a manager’s personality and level of competency; receive varied compensation and benefits for doing similar jobs (generosity and equality are not widely shared corporate objectives); encounter daily job frustrations (lack of resources, conflicts with other people and departments, conflicting policies); and worry about surviving the next reorganization. Organizational research confirms that excessive turnover is most often a function of having the wrong people in the wrong jobs. Specifically, managers who do a poor job choosing the right seeds and forget to nurture their Cubies. Excessive turnover and low productivity are symptoms of management treatment and decisions. We’ll start with executives and middle managers — the folks who make the big decisions. Although these candidates need it the most, they avoid assessment like a televangelist avoids a sunshine audit. Executive decisions require considerably more than the average level of skill. They need an almost superhuman mental ability to anticipate opportunities and avoid unexpected problems, combined with a personal charisma to make it happen. In B-school terms, this is called “expert knowledge” and “leadership.” B-school case books are filled with hundreds of examples of company executives who lacked expert knowledge and zigged when they should have zagged. Just check the business headlines for for the massive mistake of the month. If you’re hiring an executive, get past the glowing resume and dig for details. Most importantly, try to understand the skills and motivations he or she will bring to the job. Often these will not be evident in the resume, nor will they be evident in the interview. Both usually address results, but “results” are often not the same as skills. Think of results as the score at the end of the game and skills as how the game was played. You need to know skills. Key skills that should be assessed before turning over the family jewels to an executive include his or her ability to make reasoned decisions when information is totally lacking; his or her ability to persuade (not cajole) subordinates to take action; and most important, his or her hidden attitudes, interests, and motivations. When people get promoted (or elected) to positions of power and authority, the first casualty is usually humility. Dr. Bob Hogan has written extensively on how a large number of executive failures can be attributed to narcissism. That is, the executive or manager thinks he or she is above reproach. Just think of Bernie Madoff, Bank of America’s Ken Lewis, or maybe even Alan Greenspan. Assuming your executives are not poster kids for bad behavior, and assuming working conditions in your organization are better than the average troll mine, what other factors do you think have a substantial effect on turnover? Did you guess incompetent front-line managers? Employee surveys generally say front-line managers are the greatest source of dissatisfaction about their job. I don’t know about you, but I have worked for some real sociopaths. Some were paranoid about losing their job; some felt subordinates should be human shields whose purpose was to make the manager look good; and some were totally clueless about what their subordinates did. Another manager, Oblivious Pat, claimed he could learn his PhD’s job within a few months. And Horrible Howie insisted his PC be programmed so all he had to do was press one button to get anything he wanted. While some might claim these people were dipsticks in the motor of life (I would never say that) others would see them as shining examples of a management selection system that put the wrong people in the wrong job. Wrong-headed Roger should have been kept apart from human beings. Oblivious Pat should have been an auditor. And Horrible Howie should have stayed in school. Management, especially front-line management, can have more effect on turnover than any other system. If your organization suffers from high turnover, the first place to look is front-line management. Front-line management jobs come in all shapes and sizes. On one hand, there are people with a management title, but their job involves “doing,” not coaching. Their title could be a reward for good performance, an ego boost, or strategic positioning. No matter. This kind of manager does not manage. He or she is an individual contributor and should be evaluated for contributor skills, not management skills. True front-line managers are usually coaches. That is, they have the responsibility for managing, developing, or correcting the activities of the people they supervise. Front-line managers get things done through people, not by doing the job themselves. None of the managers in my examples were able to manage, and their interactions with intelligent human beings were caustic. Their behavior drove turnover. Front-line managers do not have to be expert in the jobs they supervise. They just have to know it well enough to give direction and guidance. This is not an easy skill to acquire; while some argue it can be learned, my experience evaluating managers of all types shows that few people have the skills to coach effectively. In practice, they tend to dance around the issue or make veiled threats. None of which helps their direct reports get better. Plan and organize complex activity. Be able to think analytically and see both the forest and the trees. Be able to perform the job, but not necessarily be an expert. Have the attitudes, interest, and motivation of a manager. Always remember first-line managers are cited as employees’ greatest source of stress. And stress can be a significant reason for turnover. Incoming and first-line management promotion decisions are the easiest to tackle. Simply forget about “promotions as a reward” and focus on “promotions based on job skills.” Evaluate prospective front-line manager job skills by interviewing about past behaviors, administering tests and exercises, and watching the person perform in coaching simulations. The bottom line: If you want to start reducing turnover, make sure every incoming executive and manager has the right skills for the job. Customized hiring tests for both Client-use and Business to Business distribution. 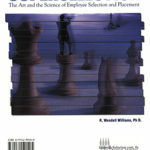 Preview our latest publication, SuperSelection. Get tips on testing and assessment in the library archive of The Aha! Report by Dr. Wendell Williams.